New York, January 30, 2019 – Over the years, Scalabrini centers and parishes in the United States have devoted significant effort to supporting, promoting, and protecting immigrant populations without regard to race, nationality, religion, gender, sexual orientation, political affiliation, or legal status, through initiatives and projects in local communities. The work developed in the centers/parishes has made a difference in many communities, generating high credibility among migrants. The support and assistance offered to migrants and their families with regular or irregular migratory status have made these centers a welcome space that helps to alleviate the process of integration and migratory traumas. For 2018, Scalabrini Pastors of the Province of Saint Charles Borromeo supported by the Scalabrini International Migration Network (SIMN) saw the opportunity to strengthen networking in the United States to achieve effective and articulated responses to the challenges posed by the social and political context for the protection and defense of migrants. The Network encompasses 10 migrant centers located in Massachusetts, New York, Washington, Georgia and Florida (Framingham, Everett, Somerville, Manhattan, Brooklyn, Washington, Riverdale, Atlanta, Margate and Winter Garden). 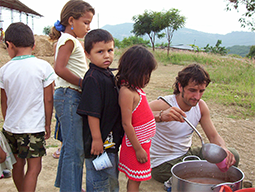 The mission of the Network of Scalabrini Centers and Parishes in the United States is to promote the integration of migrants, refugees, and forcibly displaced people in the United States by providing assistance, advocacy, and social services that facilitate their integration and empowerment into host communities.